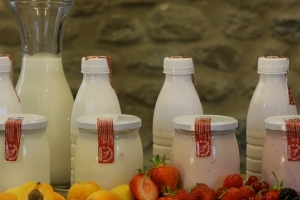 Ingredients Pasteurized whole milk, milk enzymes (streptococcus termophlus, lactobacillus bulgaricus) APRICOT OR BERRIES OR CEREALS OR STRAWBERRY mash (min 10%). Product description Soft and creamy texture. Make procedure Milk Pasteurization and to 37-42°C; Enzymes addiction; Fermentation; Curdling Breaking; Cooling; Packaging. Packaging Size starting from 550 g; packaging: in glass basin. Storage Temp 0-4°C 32-39.2°F - R.H.(Relative Humidity): 80-85% Shelf life / Best Before 60 days from the date of production. Consumption details No allergenic products are used in the ingredients. Only cows milk is used, so the product is unfit for people intolerant to milk and lactose. Conservation and Distribution suggestions In order to ensure the integrity of the product in terms of microbiological, the transport must be carried out by means appropriate to ensure a temperature of 14°C / 57.2°F. Nutritional Values 100 g of product provides 3,3 g of protein, 3,3 g of fat , 13,8 g of carbohydrates. 98 calories per serving (serving size 100g). Ingredients Pasteurized whole milk, milk enzymes (streptococcus termophlus, lactobacillus bulgaricus), sugar. Nutritional Values 100 g of product provides 3,8 g of protein, 3,9 g of fat , 6,9 g of carbohydrates. 78 calories per serving ( serving size 100g). Ingredients Basilico Genovese DOP 26%, extra virgin olive oil, sunflower seed oil, Grana Padano DOP (MILK, EGG), Pecorino Romano DOP (MILK), pinenuts, WALNUTS, Gran Toscano CHEESE (pasteurized cow's MILK, lactic ferments, rennet, salt), salt, Italian garlic, antioxidant: ascorbic acid. Product description Condiment ready to use for pasta, sandwiches, other uses in the kitchen, excellent on stuffed pasta, lasagna, boiled potatoes, mozzarella, recommended in vegetable soups. Packaging Size: 170 g. packaging: in glass basin. Storage Temp 0-4°C 32-39.2°F - R.H.(Relative Humidity): 80-85% Shelf life / Best Before Minimum guaranteed shelf life after delivery: 68 days. Conservation and Distribution suggestions In order to ensure the integrity of the product in terms of microbiological, the transport must be carried out by means appropriate to ensure a temperature of 14°C / 57.2°F. Nutritional Values 100 g of product provides 6,3 g of protein, 41 g of fat , 1,4 g of carbohydrates. 398 calories per serving ( serving size 100g). Ingredients Cow milk, Milk enzymes, rennet, salt. 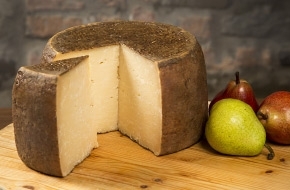 Preservatives Surface treated with edible preservative: E202 (edible rind). 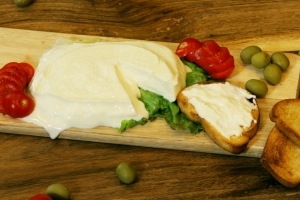 Product description Creamy, Soft Cheese with holes. Make procedure Milk pasteurization and cooling at 35° C/ 40° C; Milk Enzymes and Rennet addiction; Curdling; Manual breaking of the curdling; Manual discharge of the cheese in the moulds; Stufatura (warm, humid aging of cheese); Dry Manual Salting; Drying; Maturing. Packaging Size: g. 500/1000/2000/3000. Packaging: wooden, carton or plastic boxes. Storage Temp 0-4°C 32-39.2°F - R.H.(Relative Humidity): 80-85% Shelf life / Best Before 100 days since the packaging date. Conservation and Distribution suggestions In order to ensure the integrity of the product in terms of microbiological, the transport must be carried out by means appropriate to ensure a temperature of 14°C / 57.2°F. Nutritional Values 100 g of product provides 20 g protein, 25,5 g of fat, 1 g of carbohydrates. Serving per size 100 g: is 314 calories. Product description Soft and smooth in consistency, a particular, yet very unique in its genre due to its ingredients (the cleansing properties of coal are known from the outset ' antiquity, known for detoxifying the body). Taste is Rustic, earthy. Make procedure Milk pasteurization and cooling effects up to 35-40°C / 95-104°F lactic ferments, rennet, coagulation, cutting manually coagulated curds, manual transfer of the dough into the molds manually. Packaging Weighs between 1000-2000grams, dried in plastic trays aged on beech shelves . Conservation and Distribution suggestions In order to ensure the integrity of the product in terms of microbiological, the transport must be carried out by means appropriate to ensure a temperature of 14°C / 57.2°F. Nutritional Values 100 g of product provides 20 g of protein, 25.5 g of fat, 1 g of carbohydrates. Serving per size 100g is 315 calories. 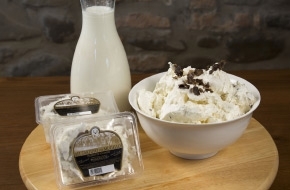 Product description Smooth and creamy dairy product. Make procedure Milk pasteurization and cooling effects by up to 20-30 °C / 68-86°F Enzymes addicition; fermentation; Curdling; Manual breaking of the curdling; Manual discharge of the cheese in the moulds; conservation in cold store (0-4° C) until sales. Packaging Weighs between 125-240grams, In a bar form, packaged in a plastic tray and outer wrapping in plastic . Storage Temp 0-4°C 32-39.2°F - R.H.(Relative Humidity) : 80-85% Shelf life / Best Before 32 days from the date of production. Consumption details No allergenic products as ingredients are used . Only milk is used , so the product is unfit only for people intolerant to milk and lactose. Ingredients Pasteurized cow milk, enzynes, rennet, salt. Preservatives Surface treated with edible preservative E202 (edible rind). 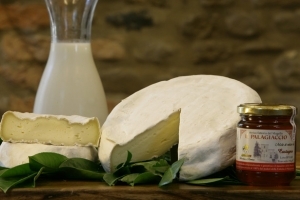 Product description Smooth and soft fresh cheese. Make procedure Milk Pasteurization and cooling to 35-40°C; Enzymes and rennet addictions; Curdling; Manual Breaking of the curdling; Manual discharge of the cheese in the moulds; Manual Dry Salting; Maturation in cold store (0-4°C) until the sales. Storage Temp 0-4°C 32-39.2°F - R.H.(Relative Humidity) : 80-85% Shelf life / Best Before 22 days since the date of production. Conservation and Distribution suggestions In order to ensure the integrity of the product in terms of microbiological, the transport must be carried out by means appropriate to ensure a temperature of 14°C / 57.2°F . Nutritional Values 100 g of product provides 20 g of protein, 25.5 g of fat, 1 g of carbohydrates. Serving per size 100 g is 314 calories. Ingredients Cow Milk, Milk Enzymes, Rennet, Pink Peppercorn, Salt. Make procedure Milk Enzymes and Rennet addiction; Curdling; Manual breaking of the curdling; Manual discharge of the cheese in the moulds; Dry Manual Salting; Drying; Maturing. Packaging Size: g. 500/1000/2000/3000. Packaging: wooden, carton or pla- stic boxes. Storage Temp 0-4°C 32-39.2°F - R.H.(Relative Humidity) : 80-85% Shelf life / Best Before 60 days since the packaging date. Conservation and Distribution suggestions In order to guarantee the integrity of product from a bacteriological point of view it is necessary to transport the product by means with technical features proper to preserve temperature below 14°C. Nutritional Values in 100 g of cheese: 12,0 proteins, 15 g fat, 3 g carbohydrates. Calories in 100 g: Kcal 195/Kj810. 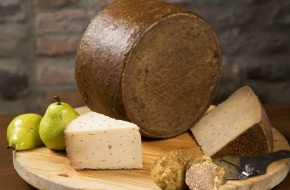 The Gran Tartufo Toscano is excellent examples of high quality cheese making, which is still regarded as an authentic art in Tuscany. 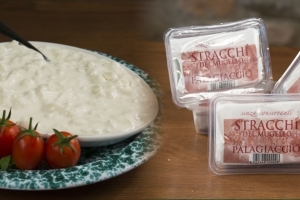 It is made from fresh cow milk, from the historic dairy farm of “ Il Palagiaccio”. 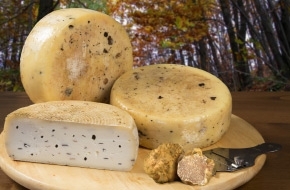 The Tartufo Toscano is an elegant cheese enriched with black and white truffle. 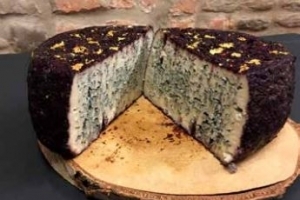 This cheese has a personality of its own,slightly creamy in texture with a rich, distinctive taste and fragrance of truffles; the truffles are found beneath the treesin the secular forest which surrounds the Historic Palagiaccio castle. Every wheel of cheese weighs between 12-16 lbspounds and aged for 12/15 months. 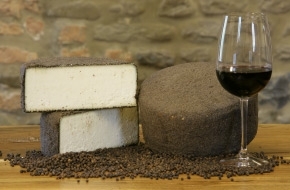 The Gran Tartufo Toscano is aged in the “Ubaldini Grottos” which are located beneath the medieval “ Palagiaccio “dating back around the 1200’s. This place was a stronghold of the feudal “Ubaldini” family, the patriarch Sir Ugolino of Senni was mentioned in Dante Alighieri’s “Divine Comedy” as being a fearless cavalier and an illustrious member of this noble family. 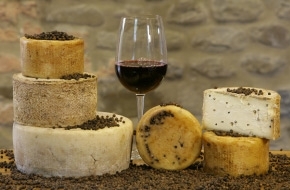 Cheeses of such excellent lineage have to be a must for important Tuscan social gatherings. - A structured red wine, that is robust and with the right amount of mature tannins. - A fine dry white wine that has aromatic floral notes and hints of vanilla. Ingredients Cow Milk, rennet, salt, lactic ferments and black pepper corns. Product description Chalky in color, Semi aged, with a compact consistency, and a distinct taste, but pleasurable of black pepper corns. Make procedure Milk pasteurization and cooling effects up to 35-40°C / 95-104°F lactic ferments, rennet, black pepper corns, coagulation, cutting manually coagulated curds, manual transfer of the dough into the molds dry manual salting, drying and semi aged. Packaging Weighs between 500-3000grams, dried in plastic trays aged on beech shelves. Storage Temp 0-4°C 32-39.2°F - R.H.(Relative Humidity) : 80-85% Shelf life / Best Before 180 days from the date of production. Consumption details No allergenic products are used in the ingredients. Only cows milk is used, so the product is unfit for people intolerant to milk and lactose. Ingredients Cow Milk, rennet, salt, lactic ferments and wild fennel seeds. Make procedure Milk pasteurization and cooling effects up to 35-40°C / 95-104°F lactic ferments, rennet, wild fennel seeds, coagulation, cutting manually coagulated curds, manual transfer of the dough into the molds dry manual salting, drying and aged. Storage Temp 0-4°C 32-39.2°F - R.H.(Relative Humidity): 80-85% Shelf life / Best Before 180 days from the date of production. Consumption details Contains an allergenic product as ingredients (WILD FENNEL SEEDS). Only cows milk is used, so the product is unfit for people intolerant to milk and lactose. Conservation and Distribution suggestions In order to ensure the integrity of the product in terms of microbiological, the transport must be carried out by means appropriate to ensure a temperature of 14°C / 57.2°F. Nutritional Values 100 g of product provides 20 g of protein, 25.5 g of fat, 1 g of carbohydrates. Serving per size 100g is 314 calories. 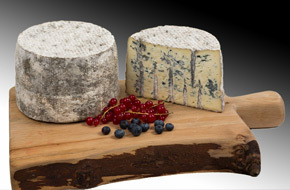 Product description Chalky in color, Semi aged, with a compact consistency, and a Peppery taste if eaten with rind. Make procedure Milk pasteurization and cooling effects up to 35-40°C / 95-104°F lactic ferments, rennet, coagulation, cutting manually coagulated curds, manual transfer of the dough into the molds dry manual salting, drying, rubbed with olive oil and manually rolled in grated black pepper. Packaging Weighs between 500-3000grams, dried in plastic trays aged on beech shelves . Storage Temp 0-4°C 32-39.2°F - R.H.(Relative Humidity): 80-85% Shelf life / Best Before 180 days from the date of production. Consumption details No allergenic products are used in the ingredients. Only cows milk is used , so the product is unfit for people intolerant to milk and lactose. Ingredients Pasteurized cow Milk, milk enzymes, rennet, salt and truffles. Product description Creamy and dense in texture, spreadable. Make procedure Milk pasteurization and cooling effects by up to 20-30 °C / 68-86°F lactic acid bacteria, fermentation, coagulation, truffle, cutting manually coagulated curds, manual transfer of the dough into the molds, cooling. Conservation and Distribution suggestions In order to ensure the integrity of the product in terms of microbiological, the transport must be carried out by means appropriate to ensure a refrigeration with temperatures between 0-4°C / 32-39.2°F. However, during distribution, the product can tolerate a temperature of 14°C / 57.2°F. Nutritional Values 100 g of product provides 16 g of protein, 2 g of fat , 2.5 g of carbohydrates. 299 calories per serving ( serving size 100g). 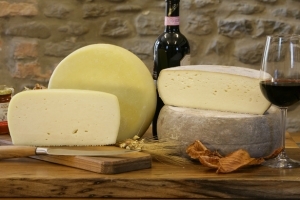 The GranToscano is excellent examples of high quality cheese making, which is still regarded as an authentic art in Tuscany. 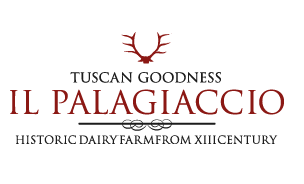 It is made from fresh cow milk, from the historic dairy farm of " Il Palagiaccio". 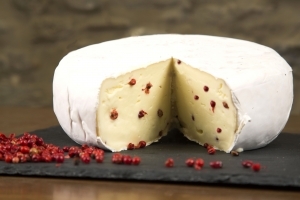 The GranToscano is characterized by its ivory colored, compact texture and intriguingly explosive flavor. 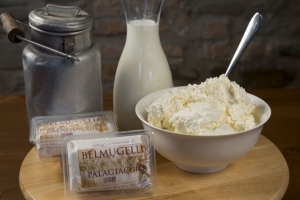 Initially it reveals the sweet delicate taste of the milk which then gives way to an intense buttery, nut flavor and leaves your mouth with the distinct taste of extra virgin olive oil. This is why it is said: "that its a cheese to savor, a cheese that melts in your mouth". The cheese wheels are worked in the artisan tradition and as a result are all different from one another varying between 12-16 lbs in weight. They are massaged individually every week with extra virgin Tuscan olive oil. 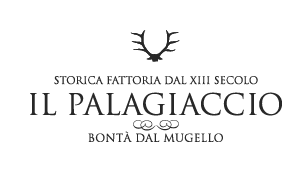 The GranToscano is aged in the "Ubaldini Grottos" which are located beneath the medieval " Palagiaccio " dating back around the 1200's. This place was a stronghold of the feudal "Ubaldini" family, the patriarch Sir Ugolino of Senni was mentioned in Dante Alighieri's "Divine Comedy" as being a fearless cavalier and an illustrious member of this noble family. 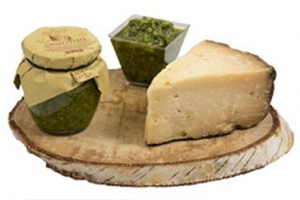 Cheeses of such excellent lineage have to be a must for important Tuscan social gatherings. 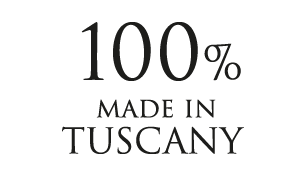 The Tartufino Toscano is excellent examples of high quality cheese making, which is still regarded as an authentic art in Tuscany. 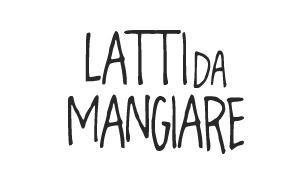 It is made from fresh cow milk, from the historic dairy farm of " Il Palagiaccio".The Tartufino Toscano is an elegant cheese enriched with black and white truffle. 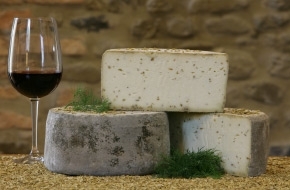 This cheese has a personality of its own, slightly creamy in texture with a rich, distinctive taste and fragrance of truffles; the truffles are found beneath the trees in the secular forest which surrounds the Historic Palagiaccio castle. Every wheel of cheese weighs between 4 to 5 pounds and aged for 3 months. The Tartufino Toscano is aged in the "Ubaldini Grottos" which are located beneath the medieval " Palagiaccio " dating back around the 1200's. This place was a stronghold of the feudal "Ubaldini" family, the patriarch Sir Ugolino of Senni was mentioned in Dante Alighieri's "Divine Comedy" as being a fearless cavalier and an illustrious member of this noble family. PALAGIACCIO U.S.A. LLC EIN 61-154063, P.O. BOX 994 Cary, North Carolina 27512 U.S.A.